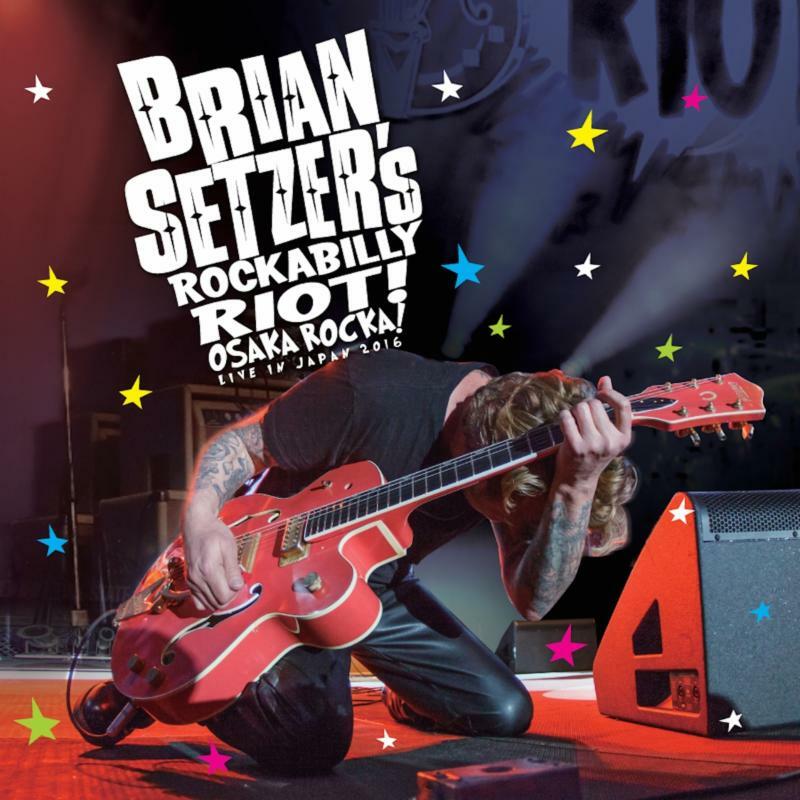 Three-time Grammy-award-winner BRIAN SETZER’s new concert Blu-ray/CD,ROCKABILLY RIOT: OSAKA ROCKA! – LIVE IN JAPAN–filmed on February 18 at Namba Hatch in Osaka, Japan–is set for release November 4, 2016 via Surfdog Records. Live and loud, the concert encompasses songs from SETZER‘s acclaimed 2014 studio album Rockabilly Riot! All Original-a sizzling rockabilly album from start to finish featuring SETZER‘s trademark twang and fretboard fire. Also included are classic hits from his Stray Cats days, Brian Setzer Orchestra tunes and tracks from his solo albums. In front of the wildly enthusiastic audience, BRIAN SETZER and his band-Noah Levy (Drums), Kevin McKendree (Piano and Guitar) and Mark Winchester (Bass)-are firing on all cylinders. You can watch a teaser video clip here and pre-orders are available starting Friday, September 30. For more information on how to pre-order, visit www.BrianSetzer.com. Meanwhile, SETZER and his 19-piece THE BRIAN SETZER ORCHESTRA will visit 32 cities beginning Saturday, November 12 in Appleton and make stops in Nashville, Los Angeles and San Francisco, among others (full itinerary here). Their 13th annual “Christmas Rocks! Tour,“ presented by SiriusXM, will feature music off their latest Christmas album, ROCKIN’ RUDOLPH, (available now as a limited edition box set, CD, vinyl or download) plus music off their three previous best-selling holiday albums; and original material from BRIAN SETZER. Tickets are on sale now; visit www.briansetzer.com for more information and to purchase tickets. Iconic guitarist, songwriter, vocalist and 3-time Grammy-award-winner, is a “Musician’s Musician” credited with continually taking chances with innovative and daring musical styles, while single-handedly resurrecting two forgotten genres of music (rockabilly in the ’80’s and swing in the ’90’s). Along the way, he has scored chart-topping hits, sold 13 million records and received the Orville H. Gibson Lifetime Achievement Award throughout his decorated career as founder/leader of the Stray Cats, his 18-piece Brian Setzer Orchestra, and as a solo artist. He is consistently cited as one of the world’s greatest living guitarists, and has a best-selling, extensive line of elite Gretsch signature model guitars bearing his name. Brian appeared in the 1987 film, La Bamba, portraying rockabilly pioneer Eddie Cochran. In 2002, Brian earned the privilege of being one of the few musicians to be animated in an episode of “The Simpsons.” That same year, Setzer was personally requested to induct Chet Atkins into the 17th Annual Rock and Roll Hall of Fame. In 2014, SETZER received the distinct honor of being asked by the Smithsonian Institution in Washington, D.C. to donate a replica of his original 1959 Gretsch 6120 “Stray Cat” guitar, joining an elite collection of musical instruments at the museum including Dizzy Gillespie’s trumpet and John Coltrane’s saxophone.